Even though I was homeschooled myself, I was not exposed to Shakespeare’s works at a very young age, which is understandable considering the language is so complex and can be hard to follow and some of the themes are pretty mature. 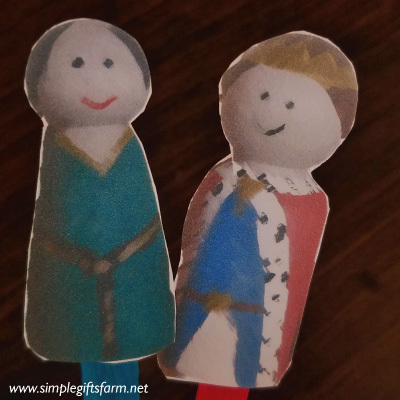 I think my first experience with Shakespeare was a class at our homeschool co-op on Macbeth. It wasn’t my favorite experience ever! For one thing Macbeth probably wasn’t the best play for to start with and secondly I was an extremely shy, awkward 13 year old and this class stretched me way out of my comfort zone. I’m sure it was good for me in the long run! 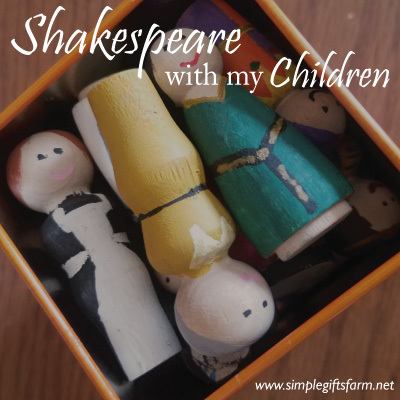 With my children I am trying to give them a gentle introduction to Shakespeare while they are younger. 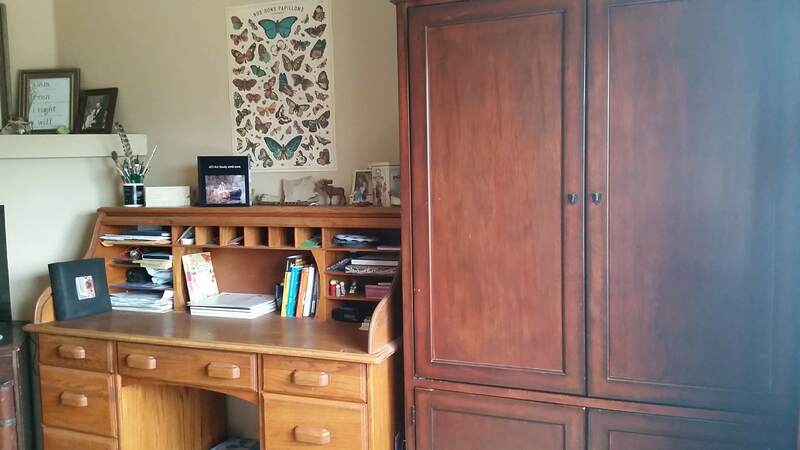 I am following the Ambleside Online(A0) schedule, and I currently have one student in year1 , one in year3 and a preschooler. In AO the students don’t begin reading full plays until at least year4, however in the earlier years they do retellingS by either E. Nesbit or Charles and Mary Lamb. I never actually got around to doing any Shakespeare when my oldest was just beginning with AO so now we all do it together during our morning time using the ones scheduled in year1. 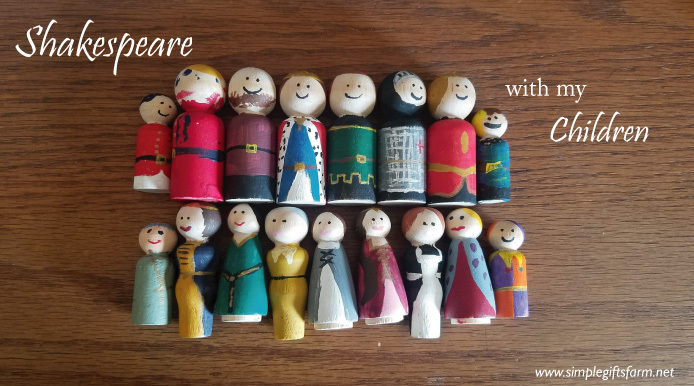 A little while back I saw some cute peg dolls painted as Shakespeare characters. My creativity was sparked and I decided to make some too. I tried to make a set that was generic enough to use for any of the plays. I mostly had a mix of shapes and sizes left over from a nativity project so I just made do with what we had. I think they turned out pretty good. It was a fun project and my oldest even painted a few with me. It did however take me a long time and they are far from perfect; that is why you won’t find any peg dolls in my shop anytime soon! Currently we are doing the Nesbit version of A Winter’s Tale. We usually do two plays per term(12 weeks) so spend 4-6 weeks on each play. 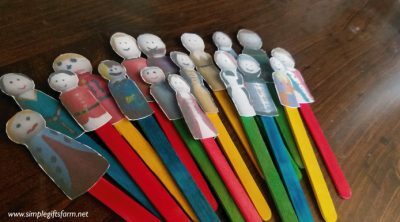 We use the peg dolls as a visual when each character comes into the story. 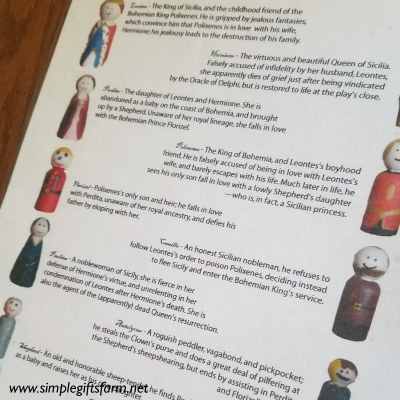 We have usually assigned each peg doll a part, but it has been somewhat confusing to keep track of which was which. So this time I made a handy cast sheet with pictures of the assigned characters to help keep it all straight. ~Week 1: introduce the characters and get familiar with them based on the character chart. ~Week 3: Read a few lines together from a scene in the actual play. I just went through the play to find a short section that seemed easier. This is the first time we are doing this so we will see how it goes. ~Week 4: Hopefully watch a version on YouTube. I am planning to try this Animated Tales version, but I am planning to preview it first. So far we are two weeks into this play and it is going well. 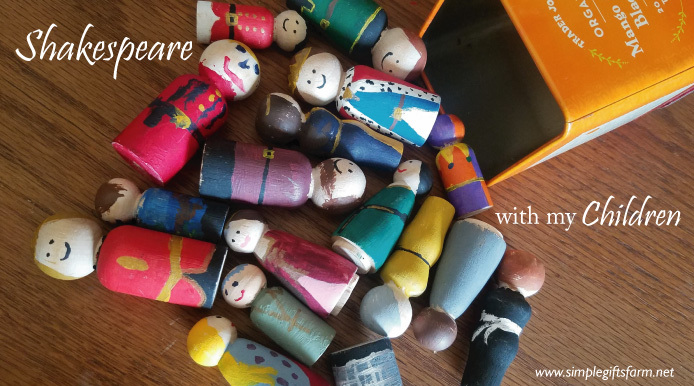 My children always enjoy the stories and the peg dolls really seem to help them follow along. I am excited to read a small portion of the original play as well to give them a taste of the original language. 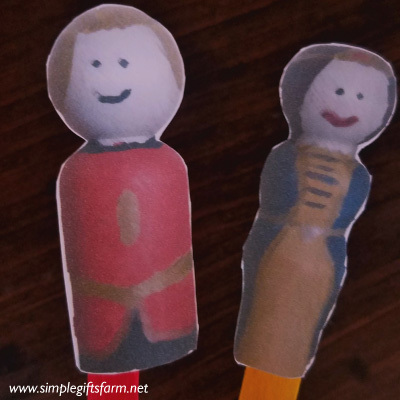 I am only just beginning in my Shakespeare study with my children and I am sure I will tweak things as I learn along with them, but so far we are having fun. I also just want to make a quick note that not all families feel comfortable or interested in studying Shakespeare especially with young children because of some of the more questionable elements. For me personally I feel that there are some excellent reasons why as Christians we should study Shakespeare. Just a few of the reasons for me are the impact he has had on our language, the historical and cultural significance of his works, as well as a thought provoking look at the human condition. For another interesting read check out this post: What’s So Great About Shakespeare?